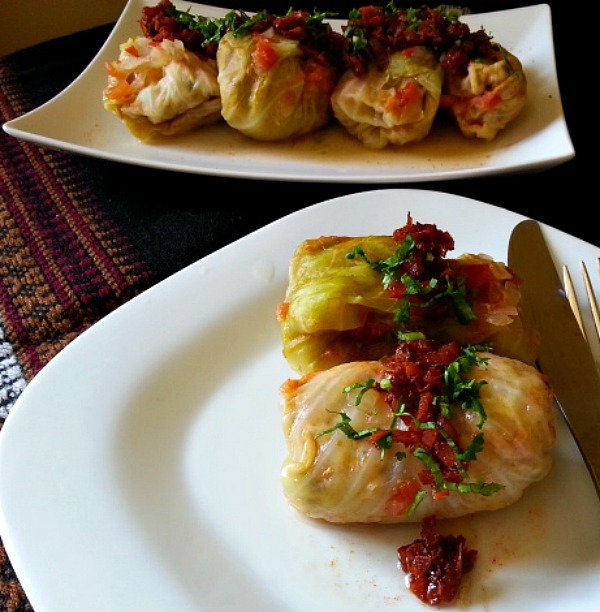 I know this is not your typical stuffed cabbage recipe. 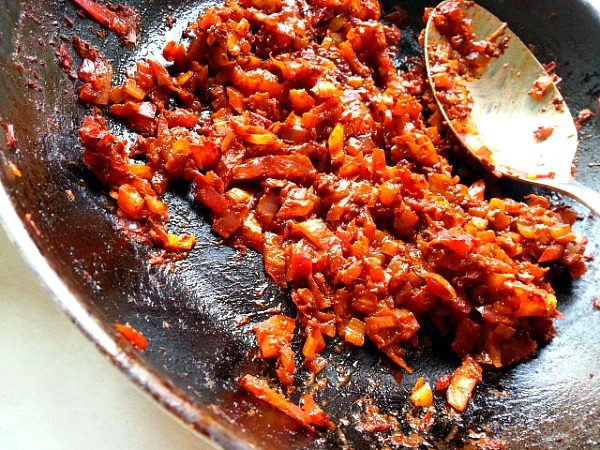 But if you love Indian Spices and Indian foods then you have to try this. Based on my humble opinion it is a one pot meal as it has veggies, meat and starch. Its works well with my low carbs and low-fat diet that I follow from the PX90 menu. But don’t ask me about the beach body workout. That’s a topic I don’t want to venture. I do know that the stuffed cabbage was originated in Eastern Europe. To give it a Indian spiced twist, I had to make a few change to the seasoning and broth so that the flavor would not clash but be enhanced. I used chicken as it’s a popular meat, vindaloo spice and fresh cilantro. Instead of using tomato puree I used a chopped tomato in the broth as the vindaloo paste is ground in vinegar and is already acidic enough. I am not a big fan of too much tomato. Cilantro also known as coriander plays an important role in Indian foods, just like parsley is to Italian cooking. Saute 1/2 chopped onions in a small pan till translucent. Add the vindaloo paste and saute for 2 to 3 minutes on medium heat. Take off heat. Let it cool. Now mix it with the ground chicken, along with the rice, beaten egg and chopped cilantro. Add salt to taste. Heat water in a large deep pot and add 1 tbsp of salt to the water. Add the whole cabbage head and cover the pot be carefully of water spillage as the cabbage head displaces water. Cook for 5 minutes. Take it of the heat and rinse it in cold running water. Carefully peel layer by layer if the inside layers are not cooked a bit or soft enough put it in the hot water for 2 to 3 minutes and follow the above steps. Keep aside. Divide the filling in equal parts to the nos of cabbage leaf and stuff the cabbage and seal them with toothpicks. Heat oil in a pot and saute the remaining 1/2 chopped onions till translucent, add the chopped tomato and saute till the tomato is soft. Now add the chicken broth and salt to taste if required. Cover and bring the broth to a boil. Next add the stuffed cabbage and cook covered for 35 minutes on medium heat. Check occasionally and baste the cabbage. Very interesting fusion cuisine. 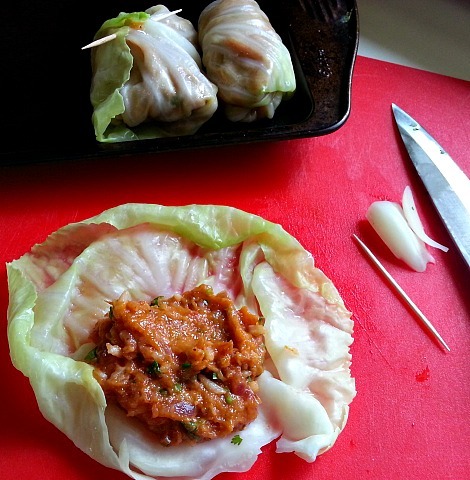 The Polish cabbage roll with Indian flair. Nice job. 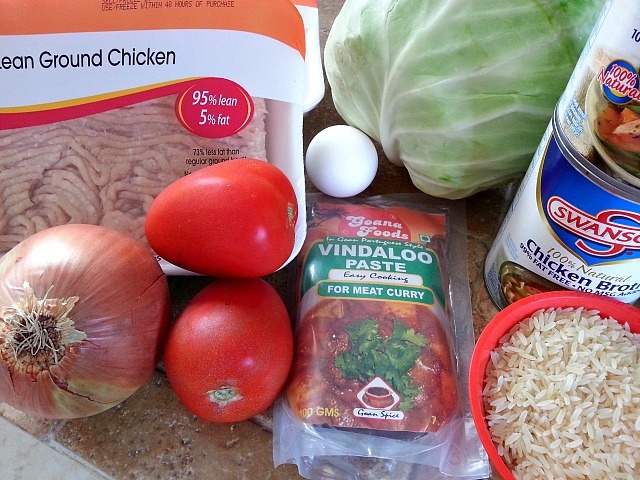 Omigosh, two of my husband’s favorite foods combined: Stuffed Cabbage and Chicken Vindaloo! I’ll have to surprise him with this one day. Ohhh that is awesome 🙂 Let me know how it goes. Certainly tempting and quite healthy too. Surely worth trying. Oh man, cabbage is one of my favorite foods ever. I can’t wait to try out all these recipes! I’m also a vegetarian so it gets hard some time to make it interesting but these all give GREAT ideas. Keep the posts coming! I wanted to let you know that I have nominated you for the Versatile Blogger Award. Hope you decide to take part. If you choose to participate then post the award badge on your blog, share seven things about yourself and nominate 15 other bloggers. Congratulations Ishita and Thank You very much for the honor, I am humbled :-). Always looking for alternative recipes for cabbage – this looks like a great one! I want to try this! Looks GREAT! That looks and sounds really delicious. 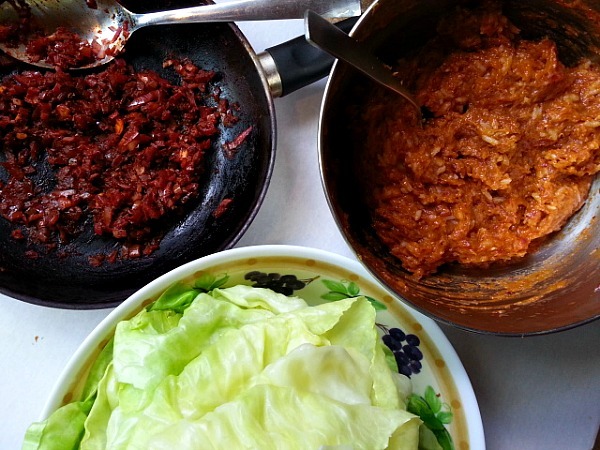 I love the idea of stuffing cabbage leaves with chicken, and especially vindaloo chicken. Yum!